Sunna Pam Furstenau. Photo taken by her cousin, Hjálmar Stefán Brynjólfsson. 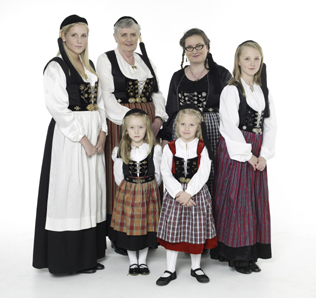 The upphlutur is modern and was sewn by Oddný Kristjaánsdóttir. One of the most noticeable things in photos taken during and shortly after immigrants arrived in Canada are their clothes. You see crowds on train platforms and you know right away from where these people have come. 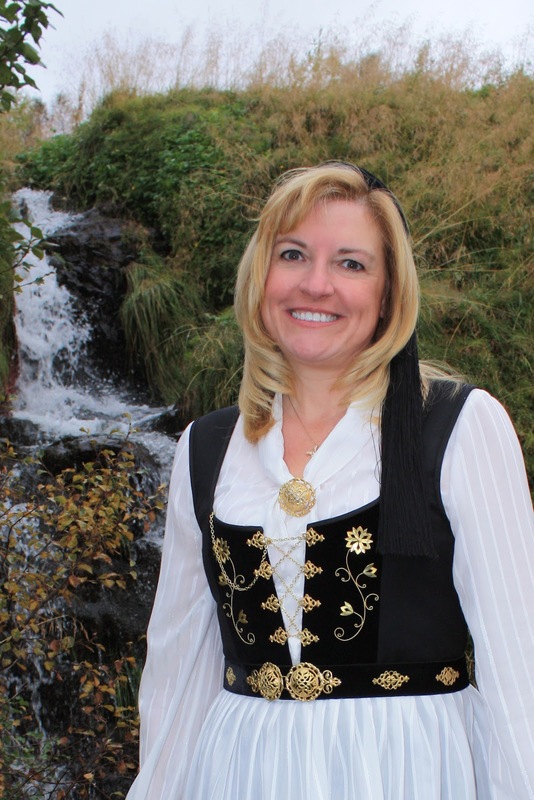 Icelandic clothes, German clothes, Ukrainian clothes, Mennonite clothes. Today, the same is true in the West End of Winnipeg. You see people in clothes from the Middle East and from Africa. You know they’re definitely not Icelandic and that they’re probably recent arrivals. The most obvious sign of integration and assimilation into Canadian society is the changing of ethnic clothes for whatever the local people wear. Part of that is because people want to fit in. However, the need to wear clothes appropriate to both work and the climate are paramount. Icelanders wore clothes in Iceland that were suitable for unheated houses that were constantly damp. The people also were constantly damp. In Independent People, Bjartur of Summerhouses says that he has been wet all his life and it has never done him any harm. Visitors to Iceland in the 1800s frequently mention being soaked through and how difficult it was to get their clothes dried out before they had to put them on the next day. There were no roaring log fires, no fireplaces, no chimneys, only holes in the floor where the precious fuel of dwarf willow, peat and dried sheep dung were burned to cook porridge or bake flat bread. Skyr didn’t require cooking. Neither did dried fish. It was pounded with a stone hammer until it could be chewed. 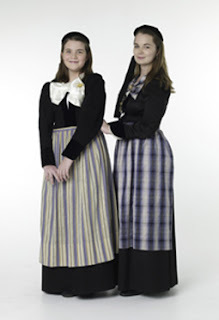 Visitors to Iceland in the 1800s and even before always comment on the clothing that Icelandic women wear. There are often long sections describing women’s clothes. 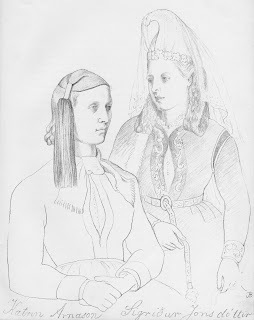 These are frequently accompanied by sketches or paintings. There are fewer descriptions of men’s clothes. The appearance of the parasols and bonnets indicate that even in Iceland clothing is changing, being influenced by European fashion in Reykjavik. As hard as life in Iceland could be, account after account describes the shock of the Icelandic immigrants in Canada when winter set in. Icelanders had never experienced anything like it. Their houses in Iceland were made of layers of rock and turf with walls two to six feet thick. Heat was provided by body heat. Twenty people might sleep in one room. Often, heat came from the sheep and cows that were stabled next to the living quarters. Clothes were made of wool. Wool holds body heat even when wet. However, body heat and wool couldn’t keep anyone warm in forty degrees below zero in a Canadian winter. Survival required that the Icelanders adapt in every way possible, including their clothes, as quickly as possible. The picturesque quality of the women’s clothes didn’t keep them warm. Also, many women stayed in the cities, particularly Winnipeg, and took work as domestics. There, they learned English ways of being clean, of dressing in an English way, of how they needed to dress to fit into city society. They had risked hardship and death for opportunity and were determined to make the best of their traveling to a new country. Living conditions outside of the city were extremely difficult. For the first few years, just as in Iceland, the struggle was to get enough food to survive. But building homes that would hold out the cold and hold in the heat from stoves was also a challenge. Cutting down trees, grubbing out tree roots, tilling the earth, were completely new. There was no farming in Iceland beyond pounding sheep manure to dust and then spreading it on the home field. The frost heaves made scything difficult and everyone worked at the haying but this wasn’t harvesting as it was known in Canada. Icelandic clothing had to give way to clothing suitable for daily life in a country where the summers were hot, the winters, cold. Icelandic clothes had to be regulated to the closet where they would remain except for special occasions. Today, we can encourage the wearing of historic Icelandic women’s clothes as a way of reminding ourselves of our identity. It helps arouse curiosity. It gives us a chance to answer questions, to impart a bit of history. It helps set us apart as our ethnic clothes are different from that of others. Wearing clothes from the time of immigration pays respect to our ancestors. It says, I remember you. I haven’t forgotten. However, it would be good if at various functions there were displays naming and explaining the different costumes so that along with a sense of the exotic there is an element of education for both ourselves and strangers. I’m quite sure that Sunna Pam Furstenau has a lot more impact on her audiences because she’s wearing her traditional Icelandic costume.